Create professional lines every time with this premium angled liner brush. You’ll love lining your eyes and brows with its fun and feminine purple bristles. It also makes a wonderful lip liner tool to create pout perfection! 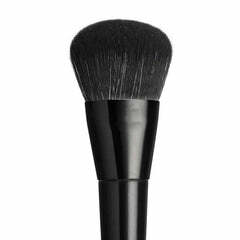 The brush is made of animal friendly vegan bristles, offering a guilt-free way to enjoy your makeup application! 7.7cm full length. Bristles - 7mm high, and 7mm wide.